Sharp fall: In Tokyo, share prices fell by more than 2% as buyers took to the sidelines ahead of a key US interest rate decision. Hong Kong: Asian stocks closed sharply lower on Tuesday as fears of a global credit squeeze returned to haunt the markets ahead of a probable interest rate cut in the US. Investors were rattled by British mortgage lender Northern Rock Plc., which has endured a run on its branches over recent days since the Bank of England extended it a lifeline last Friday. But on Tuesday, credit issues in Britain won out over potential rate cuts in the US and Tokyo and slumped 2.02% as its central bank began a two-day meet, which also would decide on any adjustment to monetary policy. Seoul shed 1.8%, Sydney was off 1.3% and Wellington was down 1.08%. Hong Kong, Shanghai and Singapore closed flat. However in late trading markets, losses were mild or ended in positive territory after European business resumed with signs the latest selloff had abated. Kuala Lumpur eased 0.1%, Bangkok was down 0.11%, Jakarta was up 0.8%, and Mumbai rose 1.06%. Taipei was closed due to forecast of an approaching typhoon. In Tokyo, share prices slumped by more than 2% as buyers took to the sidelines ahead of a key US interest rate decision. Dealers said investors were also nervous about the fallout from a global credit squeeze after Northern Rock was forced to seek a central bank bailout due to financial difficulties. 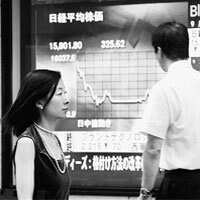 The Nikkei-225 index fell 325.62 points to 15,801.80. Turnover fell to 1.6 billion shares from 2.4 billion shares on Friday. Investors were cautious ahead of the Fed meeting on Tuesday at which the US central bank is expected to cut interest rates by at least a quarter point, dealers said. Many investors are hoping for a half-point cut to bolster the US economy in the face of a housing slump and recent financial market instability. “The market has priced in a 25 basis point rate cut and even 50 basis points may not bring much gains to the market in the US," said Ryuta Otsuka, strategist at Toyo Securities Co. Ltd, a Japanese securities brokerage firm. Concerns about the fallout from the US mortgage sector problems grew after the Northern Rock bailout and customers made a mad rush to withdraw their savings. “Unless the Fed lowers its federal fund rates by 50 basis points or indicates successive rate cuts, the market may remain weak," said Kazuhiro Takahashi, equity general manager at Daiwa Securities SMBC Co. Ltd, a Tokyo-based financial services firm. “Once US investment banks release their earnings, the impact of the subprime market trouble will become clearer and the market may start regaining confidence," Takahashi said. “But if European shares decline, it will affect Japanese shares." In Hong Kong, share prices closed little changed as gains in commodity stocks offset profit-taking in property ahead of the Fed’s interest rate decision. Dealers said the Fed decision and its accompanying statement will be watched closely to gauge the prospects for the world’s largest economy. Meanwhile, there are doubts whether Hong Kong banks can follow the expected US rate cut and reduce their lending rates, given the high interbank offer rates locally, they said. The Hang Seng Index closed down 22.49 points at 24,576.85. Turnover was HK$80.50 billion(Rs41,715 crore). “The market was a bit volatile on Tuesday and came off its lows in late trade ... as early losses were largely (trimmed) by strong showing of commodity stocks," said Matthew Kwok, research head at Tanrich Securities Co. Ltd. Trading overall was cautious as indicated by the relatively low turnover, he said. Kwok noted that commodity counters were boosted by rising crude oil prices and strong global metals prices, while property stocks saw profit-taking ahead of US rate decision. “The market has factored in the rate cut expectation," he added. “Focus will be how much the Fed will cut ... but I don’t expect local banks will follow immediately as the recent Hong Kong interbank offered rate (Hibor) is quite high." He noted that Hibor has firmed up because several initial public offerings (IPOs) have pressured liquidity. In Shanghai, Chinese share prices closed mixed with the Shenzhen bourse falling, while the Shanghai bourse was up as energy stocks offset weakness in steel makers. Dealers said positive investor sentiment toward Shenhua Energy Co.’s share sale sparked buying in the energy sector, helping push the key Shanghai index into positive territory and a new intraday high of 5,458.58. The China Securities Regulatory Commission (CSRC) said on Monday that it has given the green light to issue up to 1.8 billion A-shares for a listing on the Shanghai stock exchange. The Shanghai Composite Index, which covers both A and B shares, closed up 3.82 points at 5,425.21 on turnover of 167.85 billion yuan ($22.08 billion). “Energy stocks soared and drew investor attention, but many blue chips lost steam after Monday’s rally," said Wu Feng, an analyst with TX Investment Consulting Co. Ltd, one of the largest professional investment consultancies in China. “The room for the market to rise further seems limited, as strong resistance has emerged at around 5,500 points," said Wu. Despite the fifth interest rate hike by the central bank this year, liquidity appears still sufficient to support stocks, dealers noted. “The market faces a dilemma because of continuing sufficient liquidity but valuations are already high after the main index more than doubled this year, " said Hu Yu, analyst at Chinalion Securities Co. Ltd.
South Korean share prices closed 1.8% lower as investors cashed in on previous gains ahead of the US central bank’s interest rate decision and its assessment of the economy. Dealers said the bank may cut its federal funds rate marginally, or even not at all, in the belief that the world’s biggest economy is still fundamentally sound or for fear that rising oil prices may fan inflation. Indian share prices rose 1.06% ahead of the Fed meeting. Dealers said banking, consumer goods and oil stocks gained. The 30-share Mumbai Sensex rose 164.69 points to close at 15,669.12. Indian analysts expect the Fed to cut its 5.25% benchmark interest rate by 25-50 basic points to ease concerns over a subprime loan crisis and restore investor confidence.